When the summer arrives it feels so lovely to just enjoy grilled steak kebabs outdoors in the sun. And what tastes even better when it’s cooked right on your George Foreman grill? Today I will share one of the best George Foreman grilled steak kebabs recipes, tips for marinating properly and making these kebabs super delicious and amazing. Cut up both yellow and green peppers into squares of approximately 1 inch. Cut steak into 1-inch cubes. Set aside. In a shallow baking dish, mix olive oil, soy sauce, vinegar, Worcestershire, and garlic. Whisk for a minute so everything is well combined. 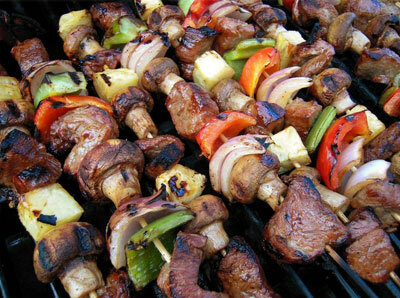 Take all the kebab ingredients and start loading up the skewers. Start with a piece of steak, then cherry tomato, green pepper, steak, yellow pepper, etc. 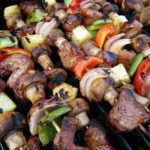 Place loaded up skewers in a dish with marinade. Let it sit covered in the refrigerator overnight if possible. When ready to grill, preheat your George Foreman Grill for at least 5 minutes with the lid closed. Use high setting if you have it. Place kebabs on the grill and sprinkle with kosher salt. Close lid. Let grill for about 3 minutes, depending on your grill. Give them a half turn and sprinkle with more kosher salt. Continue to grill another 2-3 minutes. Serve nice and warm right off the grill. Goes great with rice! This is one of the best George Foreman grilled steak kebabs recipes for making super delicious and amazing kebabs at home. These were heavenly! My husband and I would give them 10 stars if we could.